Measurement of blood flow during coronary artery bypass grafting (CABG) is not new. Since the 1970s, electromagnetic blood flow meters have been available to surgeons. However, their use was problematic. Within the surgical suite, other OR apparatus or ambient electrical noise interfered with operation of the flow meters. To measure flow, electromagnetic flow probes had to have a tight (constrictive) contact around the vessel which could heat up vessels and also cause vasospasm. Also, they were not able to measure flow in internal mammary arteries that were becoming the first choices for a bypass grafts. Because of these problems with electromagnetic flowmeters, blood flow measurement during surgery fell into disfavor. However, the tide turned in the early 1990s, especially after Dr. Charles Canver and Dr. Norman Dame published the results of their 1994 Dartmouth College study that investigated the clinical applicability of measuring internal mammary artery flow during on-pump CABG with ultrasonic transit-time technology (TTFM). 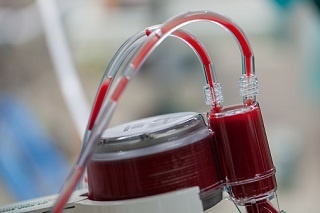 For the study, arterial and venous (saphenous vein) graft flows were measured intraoperatively in 63 patients with 3 mm and 4 mm Perivascular Flowprobes and a dual-channel Transonic® Flowmeter. Flow from the cut distal end of the internal mammary artery was collected in an open beaker while, simultaneously, internal mammary artery (IMA) blood flow was measured on the skeletonized proximal end of the IMA with transit-time ultrasound Flowprobes. Canver and Dame concluded that transit time ultrasound accurately quantitates physiologic blood flow through an IMA graft immediately after CABG and provides the surgeon with valuable information. This was the first paper to validate intraoperative blood flow measurements on the internal thoracic artery during coronary artery bypass grafting (CABG) surgery which paved the way for universal measurement of blood flow during CABG with transit-time ultrasound technology.